When there are multiple points of redistribution, and the network which is being redistributed could only be reached via one path, then the initial router which is redistributing must not choose any other path other than the one from which it initially learned. R2 receives the route to loopback 0 of R4 as an EIGRP external route. When it redistributes this into OSPF, R3 will prefer the OSPF path because of the better AD. 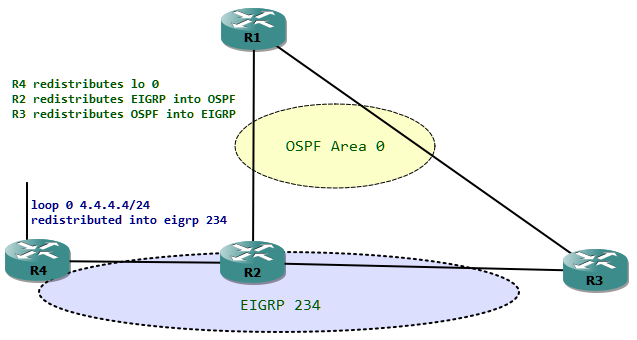 R3 then again redistributes the 4.4.4/24 network into EIGRP from OSPF. In this case R2 will have 2 paths to reach the loopback of R4 because the metric values are the same. Method 2 to 4 is effective because it denies the path via R3. The filtering method using distribute list , altering distance does not seem to work for external routes. To conclude, if a route 'X' could only be originally learned from one particular source, the same route 'X' must not be relearned from any other source. Does IPv6 Inter Router Links need a Global Address?